But the sky was grey and the road was wet. All us Californians have heard about the rain quantities in this part of the world. But the Mysterious One and I had been told about the micro-climates here. 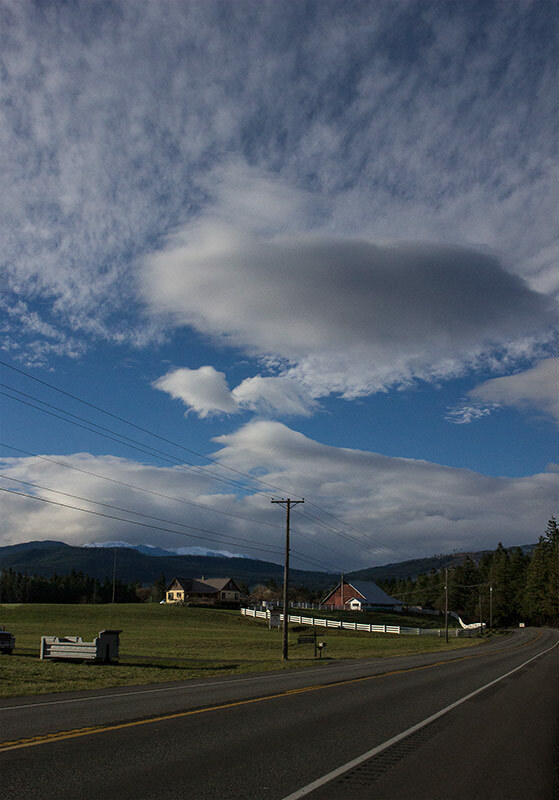 In particular we were told of the “Blue Hole” over Sequim and Port Angeles. We learned, but did not really believe, that the mountains of Olympic National Park cast a rain shadow. We’ll we came around the curve toward Sequim and there was the Blue Hole! I was flabbergasted by the snow on the mountains, which seemed to be right in the back yard, because the air is so clear. The land flows gently down to the sea from those mountains, and has been use for dairy land for a few many years now. Hence the picture of a dairy farm with Hurricane Ridge in the background and the Blue Hole overhead. I don’t know enough to write about the native peoples here. But some have casino enterprises on tribal land. Oola and I probably won’t become involved in that activity. I read in the local paper that the Clallam County tribe is looking into pot (which is legal here in WA, but — we have found — not always welcome.) “The U.S. Dept of Justice said that Native American tribes can grow and sell marijuana on tribal lands”, says the local paper. There is controversy, and much discussion. We did, however, stop for brunch at the Longhouse’s Market and Deli outside Sequim. 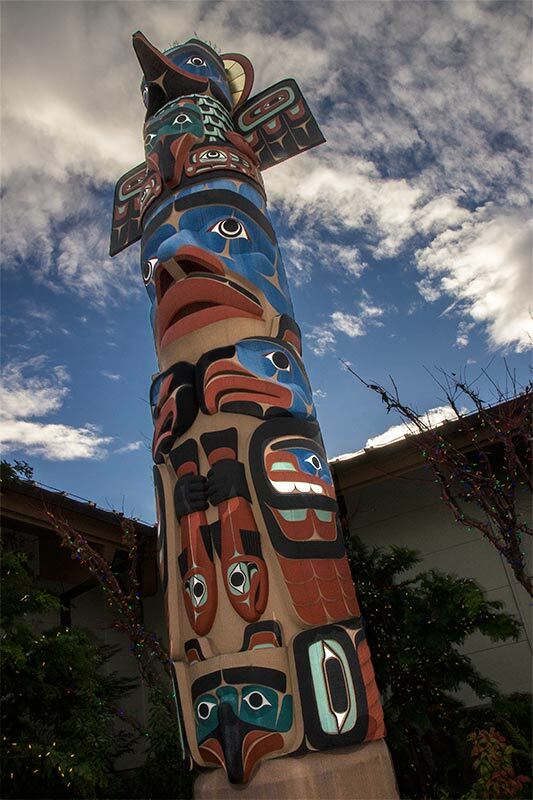 There we found this beautiful totem sculpture named “The Salmon Bringer”. Designed by Dale Faulstich, and carved by him along with Nathan Gilles, Harry Bulingame and Bud Turner in 2007. What a beautiful statement, especially in this world where some people are trying to capitalize on Frankensalmon, and the native rivers of the West Coast are dammed, drained, polluted and overused.